Among its benefits to the world of cricket (bringing in the dough, providing a three-hour runfest for millions), the Indian Premier League is turning into a great venue for the superannuated cricketers of yore looking to earn the big bucks before their limbs fall off. 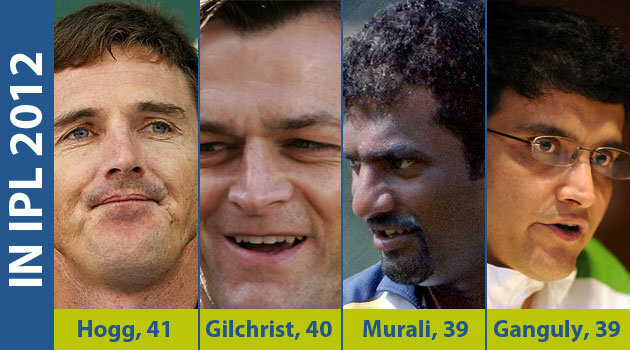 To Australian Adam Gilchrist (aetat 40), who’s played the IPL for a number of seasons, add Australian Brad Hogg (41), Indians Sourav Ganguly (39) and Rahul Dravid (39), and Sri Lanka’s own, Muttiah Muralitharan—the last of whom turns 40 today. Happy birthday to the master! The IPL was intended to blood “the young uns,” but has actually become a glorified all-star game for an audience hungry to see the greats and also-rans of yesteryear in a competition freed from national identity and the constraints of touring. And why not? It’s a treat for the players as well to be on the same side with, or in competition against, some of these legends. In our last post, we cast aspersions on Shiv Chanderpaul’s box-office boffo-ness. Perhaps when he’s done the hard yards with the West Indies (he’s now 37) he can reinvent himself in his dotage for the IPL. This entry was posted in Cricket, IPL, T20 Cricket and tagged Adam Gilchrist, Indian Premier League, Literature, Muttiah Muralitharan, Rahul Dravid, Shivnarine Chanderpaul, Sourav Ganguly. Bookmark the permalink.